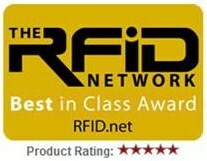 This week, The RFID Network awarded Intelleflex with a “Best in Class” award for our battery assisted passive (BAP) tags. It’s great to have independent validation of the claims we make about the performance and capabilities of our products. In our marketing materials, we attest to provide read/write performance at free range distances of 300 feet (100 meters), The RFID Network’s tests demonstrated read ranges of 403 feet (123 meters), breaking the record for previously tested BAP tags. The RFID Network’s host, Louis Sirico, published a product review on their website and produced an interesting video that discusses their impressions of our XC3 Technology RFID tags. You can read the product review and watch the video here.